I have been contemplating on getting a new hair color. I had it colored last year and it went from golden brown to nasty blonde as time went by. Blame me for the lack of time and even patience to care for my hair. I sometimes skip conditioner because I am always in a hurry. Earlier this month I was invited by Status Salon and Matrix Philippines to try out their latest hair color range which is the dual hair color services. I was pretty excited for this change. Right after work, I went to Status Salon in Katipunan to undergo hair color and treatment. I chose wonderbrown warm 5 because I want a brown shade. I specifically asked the stylist that I want her hair color. haha I know right! After hair color, they treated my hair with Matrix Biolage which smell soo good. 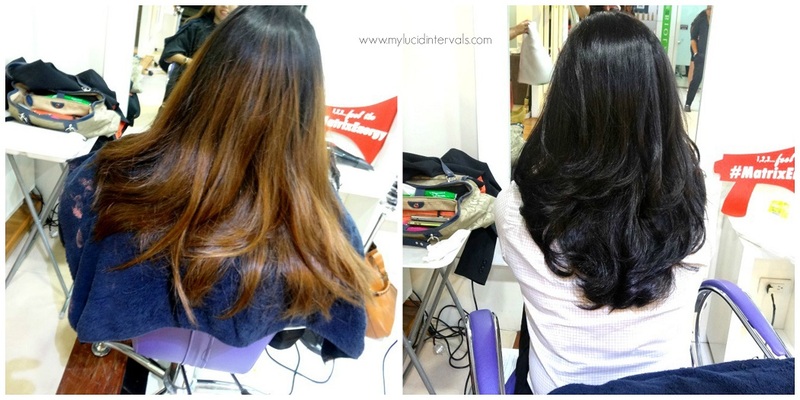 after the treatment, I was stunned to see my hair dyed into black instead of warm brown. Compare the stylist's hair to mine! Ang layoo! I was really unsure of my hair color. Then, she layered my hair and the layers was extreme. Shheez! I for got to explain that I want minimal layers only. Now, I am appreciating my layers because my hair looks fuller and voluminous especially when curled. I was honestly uncomfortable with my super dark roots. The stylist told me that it will eventually lighten after 3-4 washes. I did not believe her! haha Of course, I was that skeptical this..Truth be told, my hair is now lighter. Actually under the sun and direct light, it has a hint of brown. You can check the last photo for reference. I also took home the Biolage Color Bloom Mask. This mask is a treatment for coloured hair enriched with orchic extract and UV Filter Complex that helps preserve the and protect the radiance of color-treated hair. It has a creamy texture that wraps the hair in 360 degrees conditioning. This mask leaves my hair well moisturized throughout the day. It lessens that frizz and it acts as a very powerful deep conditioner that softens the hair leaving it silky smooth. Also, the scent of this mask is very addicting!! I am loving it now after it lightened. My hair looks healthier too! What do you think of my new hair color? wow! nice! transformed into a more voluminous and healthier one! how how much po? Makes you look younger and, at the same time, more professional.